"In this recipe, my most favorite American street food gets a makeover for the Korean palate. Jean-Georges created a kimchi relish that's made sweet with honey and sour with rice vinegar. All you need is a baseball game and you're good to go." Preheat a grill to high or preheat a ridged cast iron grill pan over high heat. Mix together the kimchi, honey, and vinegar in a small bowl. Grill the hot dogs until browned and crispy, and lightly grill the rolls until they're golden brown. 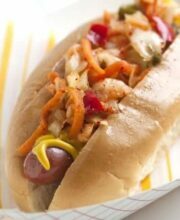 Put the hot dogs in the rolls and top each one with 1 tablespoon mustard and one-quarter of the kimchi relish. Hot Dogs with Kimchi Relish Recipe - Copyright 2017 Steamy Kitchen, Inc.